By this useful Article I guide you that How to save your skin from summer heat and look beauty and happy. I am talking about your health and care like other tutorials and lot of peoples tend to think about winter and autumn weather but however summer scorching heat and humid weather, equally required special for your skin, and cleaning. In summer days sun Rays are very sharp and contain a lot of UV Rays which cause too much harm to your skin and it intact to your beauty. Skin summer is very difficult task for everybody it require moisturize and cleaning your skin on daily basis. 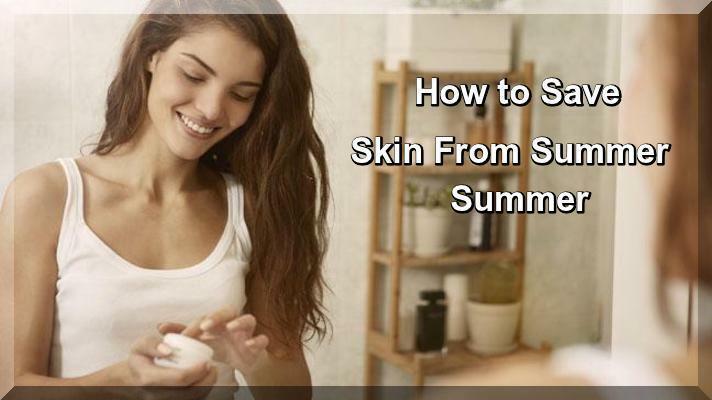 I guide you step by step following tips and tricks about how to save your skin in summer days, following beauty tips and tricks are totally free without wasting of time and your precious money. Lemon is considered as a bleach agent and is an brilliant source for cleaning your skin and avoiding it from getting coffee. The peoples with oily skin can apply lemon without adding anything however it you have dry skin, mix a table spoon of honey in 1 Table spoon lemon juice and apply it on your skin Wash after 20 minutes and you will have a fresh and clean skin, it is easy cheap. Use lot of water on your skin by contain a face spray, you can make face sprays at home as well as by using only two or three elements. If you do not like the idea of spray on the face something on the face all day but water, then fill simple water in a spray bottle and spray after few minutes. This is a brilliant tip and trick for those who have remain whole day outside as this keeps your skin soft and more clean in summer days. Moisturizing is very important in summer days, even in the hot days, where on worry a lot, moisturizing the skin is equally important and helpful to remain the skin healthy, and soft. Due to hot weather and nonstop panic the body loses the water content more quickly than once can visualize and this causes dehydration and drought. To prevent this one must keep the skin moisturized by washing the face or using a face spray and also by apply a very light slim moisturizing cream with a very thins again and again. You should be purchase cosmetics, and ask for summer cream whose only purpose is to moisturize the skin. Before buying a product always knows your skin type and that which products outfit you well, specially moisturizing is well for your skin in summer days. When you are travelling in the sun and heat you should be use umbrella, you should be keep and carry an umbrella whenever going out in the sun and heat, as it support us to make a barrier your skin and scorching of sun rays, and it is chance to save yourself from heat stroke. It is the best way to save your skin and body from UV Rays to use sun block, there is lot of benefits of sunblock, when you are going to outside from your home. You should be check before buying of sun block, I think sun block should not be too thick as it may block the pores and prevent the skin from mouthful of air. I hope this article is very useful like other tutorials and enjoy.